"Have a good time recollecting diamonds while flying"
The video game presented here is called A Flipping Good Time. It’s a freeware game belonging to the platform category where you’ll be flying from diamond to diamond. You’re a little boy going diamond chasing in a huge abandoned mine. Now, that boy also wears a red cape, just like Superman, and as such he can also fly, playing with gravity. 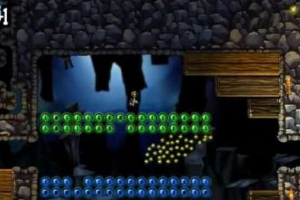 Now, in A Flipping Good Time you'll navigate your character through the mine following the coloured gravity indications. Green means normal gravity, which means you’ll fall immediately, blue ones encountered will send you upwards, so you’ll need to be careful. This game is suitable for the younger ones who will be able to manage it fairly easy and its difficulty level is not elevated. So, if you’re ready to collect some diamonds, flirting with gravity, proceed to the download.